Farmer Mateo Perez and his wife, farmer Doris Benitez. Blue Bottle proudly buys their coffees through Catracha Community Company. All photos courtesy of Carly Getz. Since 2012, Blue Bottle Coffee has been a proud buyer of Catracha Coffee Company, a Honduras-based social enterprise started by coffee farmer Mayra Orellana-Powell. This March, after years of tasting its exquisite coffees at our Oakland Roastery, Green Coffee Coordinator Carly Getz finally had the opportunity to meet the eight producers whose work she's been enjoying for so long. "Catracha’s coffees are getting more delicious with every harvest," says Carly. "I’ve been inspired by Mayra’s story for many years now, so getting the chance to experience the fruits of her labor and the impact she’s had on her community was a sight to see. It's so encouraging to hear the work Catracha is doing to promote a quality-driven market to increase premiums for producers." Carly's ten days in Santa Elena—a municipality near Marcala in the department of La Paz—were busy ones. As well as visiting with coffee producers and their families, she also consulted for the Catracha crew as a specialty coffee insider. "Catracha is currently in the process of building out a lab so they can cup individual day lots, which can be a great way to trace back successful processing practices at the farm level," she says. Carly cups Blue Bottle coffees with women farmers from Santa Elena. As well as exporting coffees, Catracha provides consulting services to small-lot farmers who grow for buyers like Blue Bottle. Carly's feedback on topics like roast profiles for cupping samples, the calibration of cupping language, and Blue Bottle's cupping standards are key for local producers who want to remain competitive in the coffee industry. Though Carly's expertise is helpful for producers at origin, the exchange goes both ways. "I manage our approvals process in our cupping lab, so as a member of our buying team I sample roast offers from around the world, then present them to our Green Coffee, Quality Control, and Roasting teams to see if they are the right fit for our menu," says Carly. "Having the chance to help build a cupping lab in a completely new environment really put what I’ve learned to the test. It was a really exciting challenge." "While visiting origins like Santa Elena," she goes on, "I've had more than a few lightbulb moments while watching coffees be picked, de-pulped, dried, and de-hulled. Also, getting to meet the faces behind names I’d seen and read about for three years was surreal!" Producer Porfirio Lopez with his family in their solar dryer. Catracha's impact goes a lot deeper than coffee. "Mayra and her husband, Lowell, are dedicated to providing their home and resources for just about anything you can think of," says Carly. Over the course of her short visit, Mayra and Lowell hosted three sewing classes, two jewelry classes, two brewing classes, a cupping, a baking class, and an entrepreneurial course for local youth. "The community ties they have made are evident in the constant buzz in their household," says Carly. "There's never a dull moment." "Our friends at Catracha want Blue Bottle's guests to know the importance of a quality-driven market," says Carly. "The concept of higher price for better quality seems like a simple one, but requires a complex chain of events to make possible. This message isn’t unique to Honduras by any means, but is one I feel like we’ve embraced in our buying practices at Blue Bottle. Our guests are playing an essential part in this process by simply enjoying the product and appreciating the hands that made it delicious." 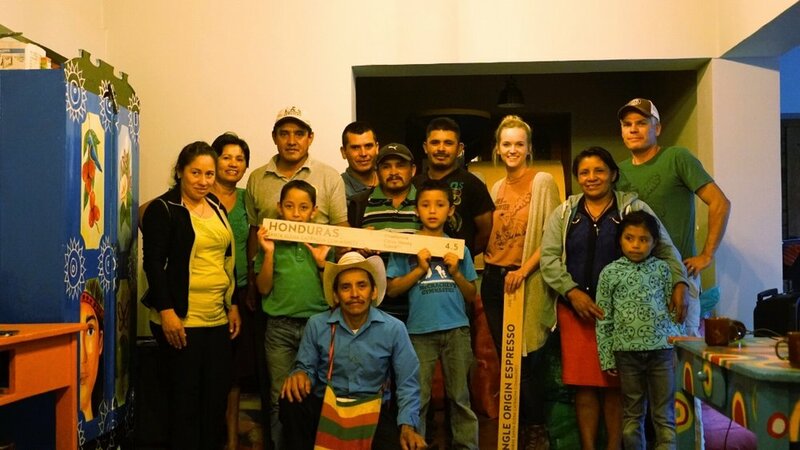 At the end of her trip, Carly and Catracha hosted a pizza party to celebrate Blue Bottle's Santa Elena producers. "It was a powerful moment, getting the chance to thank them on behalf of Blue Bottle for their hard work and for being such an essential part of our company’s growth and success," says Carly. "They shared their gratitude for Catracha, and Blue Bottle’s partnership. Farmer Mateo Perez was one that had a lot to share, saying that coffee is his family's way of life, and one of the only options they have for income. Catracha makes it possible for his family to make a living, and he’s proud of his community and what they’ve been able to build together. He said to tell our guests, 'You’re drinking coffee from one of the best mountains in the world.'"